LOST is my favorite TV show of all time. There. I said it. I actually say it all the time and it usually elicits a violently varied spectrum of response. But that’s for another discussion. My second favorite TV show is Breaking Bad. It is that rare show that got better with each season. The writers managed to raise the stakes while maintaining believability. And when given the opportunity to end on its own terms it ended magnificently, satisfying its viewers in every conceivable way. In an era of the anti hero, Walter White was the most relatable. He was your father, your brother, your teacher, your friend. He was you. He was me. He just wanted to feel good about himself and to be respected. And he would do whatever it took to achieve that. When it was announced that they were creating a spin off based on one of the side characters, who mostly supplied the comic relief, I had reservations. I had downright concern. Were they really going to turn one of the best shows ever, a tense, dramatic thrill ride, into a sitcom? Spin offs are tricky and almost never as good as the parent show. Most common are comedies from comedies. All In The Family spun off Maude, The Jeffersons and Good Times. The Mary Tyler Moore Show spun off Phyllis, Rhoda and Lou Grant (the rare drama from a comedy that was very successful.) Cheers spun off Fraser. I don’t count CSIs, NCISs or Law and Orders. Those are procedural franchises not spin offs. Creating a successful spin off from a Drama series is just not done. I looked forward to Better Call Saul in hopes that my fears would be proven unwarranted. Vince Gilligan and Peter Gould know what they’re doing! Bob Odenkirk can carry an hour long drama! This would not be a mediocre embarrassment derived from the best executed show ever on television! Happily, it’s not. It’s actually really good. The very first scene in episode one is in black and white which would usually indicate a flashback but in this case it is the ‘present’. Shady lawyer Saul Good man is working in a Cinnabon in Omaha, Nebraska just as he said he would end up if he was lucky in the second to last episode of Breaking Bad – Granite State. Saul is wearing a bushy mustache and seems to be stressed out when he sees an ominous looking fellow looking at him. Saul is in hiding with a new identity and no longer a lawyer. This is the aftermath of being Walter White’s attorney: A life living on the run and hidden behind a cinnamon roll mask. The next thing we see is Jimmy McGill in court. It’s 10 years earlier and this is who Saul Goodman ‘was’ before he became the ‘criminal’ lawyer of Breaking Bad. Jimmy is not a very good lawyer. In fact, it seems he is only trying to be a lawyer because of his older brother Chuck, played by Michael McKean. Chuck is housebound due to an odd condition of being allergic to electro magnetic fields. It’s psychosomatic and Jimmy feels he’s to blame somehow. Jimmy looks after him while trying to piece together a law practice out of a nail salon. Those of us who know Breaking Bad know what becomes of Jimmy. He becomes Saul Good man and a shady lawyer with criminal connections and a criminal himself. The show has the feel and look of Breaking Bad while presenting a different story. This is due to many of the same writers and directors and crew being involved as well as a few of the characters from Breaking Bad. Mike Ehrmantraut wonderfully played by Jonathan Banks is integral to this as well. He brings gravitas and danger to the show. In episode 5, titled “Five-0”, we get Mike’s back story and it doesn’t disappoint. Jonathan Banks should get another Emmy nomination for this one. What I find exciting about the show is how much room they have to play with time. The series opened with the ‘present’ showing where Jimmy is now and the show itself is a flashback. But within that premise they flashback even further to Jimmy’s past. The show has the freedom to move around within a wide spectrum of time. I would love to see them do a cold open that took place during the events of Breaking Bad and show a scene we all know but from Saul’s point of view. 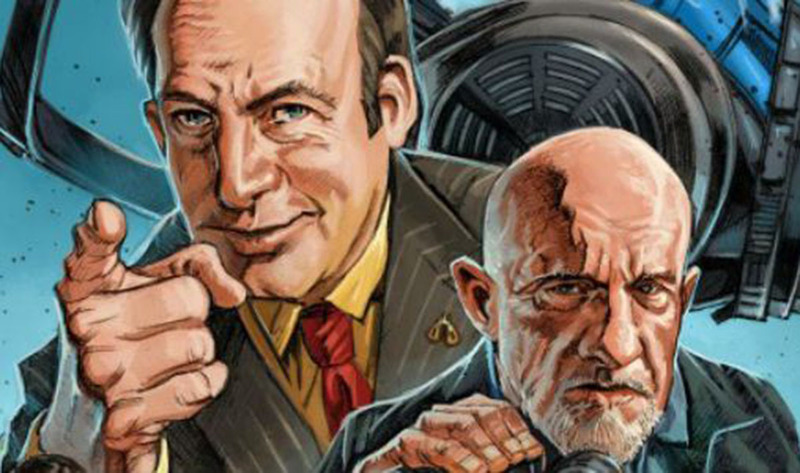 The show could also bring in Hank (Dean Norris) and Gomie (Steven Michael Quezeda) at some point as well as Gus Fring (Giancarlo Esposito) who we know Saul and Mike get involved with at some point. The show has lot of places it can go and Bob Odenkirk, who has proven himself to be a fine supporting actor in Breaking Bad and Fargo as well as in films such as Nebraska can now add leading man to his list of accomplishments. He really delivers the goods here and gives us a man who is trying his best to walk the straight and narrow but is destined to fail.